While there are plenty of reasons to dislike the World Bank, United Nations, and (especially) the International Monetary Fund, the worst international bureaucracy on a per-dollar spent basis has to be the Paris-based Organization for Economic Cooperation and Development. The OECD used to be relatively benign by the standards of international bureaucracies, but it has veered sharply to the left in recent years and some of the bureaucracy’s “research” now is more akin to talking points from the Obama White House. And it getting worse. I wasn’t even aware that the OECD had a Directorate for Employment, Labour, and Social Affairs, but the bureaucrats in this division are – if this is even possible – pushing the Paris-based bureaucracy even further to the left. At least that’s my conclusion after reading a new study from that Directorate on inequality and growth. You can read the entire 64-page paper if you’re a masochist, but you’ll get the full flavor by perusing the OECD’s three-page summary. Here are the headline results. New OECD analysis suggests that income inequality has a negative and statistically significant impact on medium-term growth. Rising inequality by 3 Gini points, that is the average increase recorded in the OECD over the past two decades, would drag down economic growth by 0.35 percentage point per year for 25 years: a cumulated loss in GDP at the end of the period of 8.5 per cent. …Rising inequality is estimated to have knocked more than 10 percentage points off growth in Mexico and New Zealand, nearly 9 points in the United Kingdom, Finland and Norway and between 6 and 7 points in the United States, Italy and Sweden. On the other hand, greater equality prior to the crisis helped increase GDP per capita in Spain, France and Ireland. Yes, you read correctly. We’re supposed to believe that Spain, France, and Ireland have enjoyed better growth. I guess France’s stagnation is just a figment of our collective imaginations. And those bailouts for Spain and Ireland must have been a bad dream or something like that. By the way, I’m not arguing inequality is good for growth. Indeed, it can even be bad for growth if the rich are using government to line their pockets with growth-stifling bailouts, handouts, subsidies, protectionism, and other forms of cronyism. So is that what this study is arguing? Hardly. Let’s move from absurdity to ideology by reviewing the OECD’s supposed solutions, which sound like something you would get if you created some sort of statist Frankenstein by mixing DNA from Francois Hollande and Elizabeth Warren in a blender. The most direct policy tool to reduce inequality is redistribution through taxes and benefits. The analysis shows that redistribution per se does not lower economic growth. …previous work by the OECD has clearly shown that the benefits of growth do not automatically trickle down across society… Policies that help to limit or reverse inequality may not only make societies less unfair, but also wealthier. …Anti-poverty programmes will not be enough. Not only cash transfers but also increasing access to public services, such as high-quality education, training and healthcare, constitute long-term social investment to create greater equality of opportunities in the long run. Part of me wants to make snarky comments about the absence of credible evidence. After all, if Spain, Ireland, and France are the success stories, the opportunities for satire are limitless. But perhaps I should be more mature and simply note the real world contradicts this supposed research. Why is it, after all, that the countries that are most fixated on coercive redistribution tend to have the weakest economies? Though the most remarkable thing about this study is that it is contradicted by other OECD research from the Economics Department, which is home to a more sensible crowd that periodically finds that larger governments and redistributive tax policies undermine economic performance. Let’s return to the study from the Employment, Labour, and Social Affairs Directorate. Like most logical people, you may be wondering what sort of rationale the OECD offers for this agenda of bigger government and higher taxes. Apparently it’s all based on the notion that poor people won’t acquire skills (human capital accumulation) if rich people have a lot of money. I’m not joking. The evidence is strongly in favour of one particular theory for how inequality affects growth: by hindering human capital accumulation income inequality undermines education opportunities for disadvantaged individuals, lowering social mobility and hampering skills development. We’re not given any plausible reason for why this happens. Nor are we given any explanation of why poor people will want to acquire skills if the government makes dependency more attractive with expanded redistribution. In other words, it appears this is yet another example of the OECD engaging in statistical and analytical gymnastics in order to produce something that will justify the bad policies of member nations. But you have to give the bureaucrats credit. This new “research” is having the desired effect, leading to news reports that will be very pleasing to advocates of bigger government. Consider these excerpts from a story in the EU Observer. The report, published on Tuesday (9 December) by the Paris-based OECD, refutes the concept of ‘trickle-down economics’… “Income inequality has a sizeable and statistically significant negative impact on growth,” the report says, adding that “redistributive policies achieving greater equality in disposable income has no adverse growth consequences.” …In response, the OECD urges governments to hike property taxes on property and wealth and scrap tax breaks that disproportionately benefit higher earners, alongside greater support for the bottom 40 percent of earners to make sure that they are not left further behind. “As top earners now have a greater capacity to pay taxes than ever before, governments may consider re jigging their tax systems,” argues the report, adding that governments should also increase access to education, healthcare and training. “Anti poverty programmes will not be enough,” it states. Writing for Forbes, Tim Worstall also notes that this sloppy OECD report is being used by statists to advance an ideological agenda. We’re not surprised that The Guardian has leapt on this little report out from the OECD concerning inequality and GDP growth over the past 30 years. It conforms to every prejudice that that newspaper is every going to have about the subject. However, it should be pointed out that this report from the OECD is in fact howlingly bad. It manages to entirely ignore the OECD’s own research on exactly the same subject: the impact of inequality and attempts to reduce it on GDP growth. The bottom line is that the OECD is working to advance the interests of the political class, not the interests of poor people. 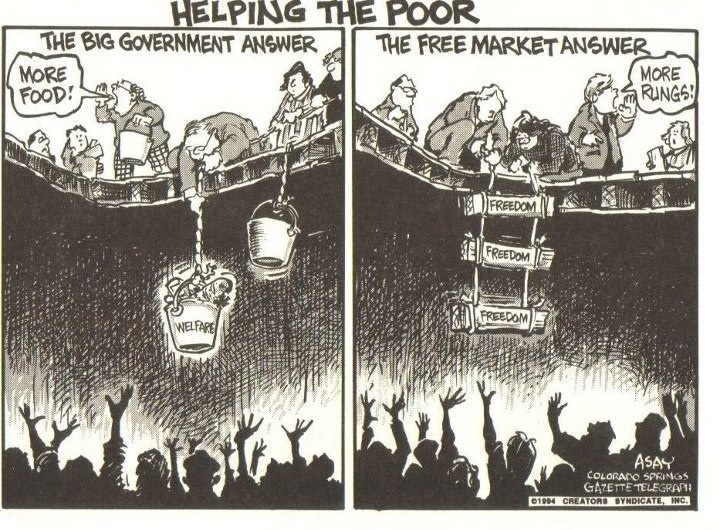 If the bureaucrats genuinely wanted to help the less fortunate, they would be pushing pro-growth policies. Instead, they promote a bigger burden of government. If you want to know more about the OECD’s economic malpractice, here’s the video I narrated for the Center for Freedom and Prosperity. But if you don’t want to listen to me, here are some examples of statist policies that are directly contrary to American interests. And don’t forget that you’re paying for this nonsense. American taxpayers finance the biggest share of the OECD’s budget. on June 18, 2015 at 10:06 pm Proof that Inequality Harms Growth? Your thinking is flawed. Corporations and individuals are sitting on cash because regulations and taxes have made it difficult to start new businesses. Increasing taxes will worsen the situation. It is true that the economy is 66-70% consumption. However, a good portion of the remainder normally goes into investments that stimulate growth. If you take that away the way the Europeans have done you slow the economy further, helping no one. If “middle class economics” works, where are your examples? Companies are sitting on piles of cash which they are unable to invest profitably.Why? At the same time, the consumer is in debt and sees health and education costs growing faster than inflation, while salaries are stagnant. Do you think these phenomenon are related? The economy is 66% consumer spending. What the author does not see, and the OECD does, is that a mild redistribution of unused cash from corporations and top earners, to cash-starved middle class will CAUSE growth, not prevent it. The arguments against redistribution are based on phony morality and not economics! Arguments that huge redistribution is self-defeating are irrelevant. If redistribution works so well, why are we rolling up the debt everyday under the biggest handout pump to exist in the Whitehouse? We are spending what 64% of each dollar on entitlements? And we borrow $0.30 of every dollar spent, last I checked. My husbands latest check stub was gross $75,000 working 60 hour weeks and his net was $41,000. $7,000 went to 401k/health. Factor in property tax and the tax on the 401k when we pay it, I can’t believe we still have people with their hands out. I can’t work because of 2 health issues, but we don’t get handouts for it. I worked from 11 years old to 25 yrs, but now I can’t. I do some design work when able to help with food cost. We have a family of 3 and we struggle with $65,000 (typical gross/ 40 hr weeks). Yet families that don’t work, mooch off others, for no reason besides choice, have the nerve to keep their hands out? We have a home paid for, but refinanced to pay medical bills, and have to pay tax increasing more, to cover the cost of someone else’s free housing? And now they are increasing it all through this crap health care exchange and Obama phones… why does a person with no job need a cellphone paid for by strangers with jobs? Why is it ok to take food out of his family’s mouth to give it to a family with 7 kids by choice? 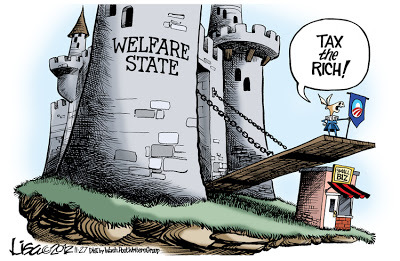 Really, how long will it be before everyone gives up because moochers live better than people who try? To top it off, the education system paid for by the non-Liberal leeches, is teaching the children to think like them, so I’m homeschooling my son, maybe my nephews too. It’s all so baffling. The best country in the world is being gutted by a specific group of people, and we can’t seem to stop it. There are three groups: “A” includes those at the bottom; “B” includes those at the top; and “C” includes government bureaucrats. An initial growth state would include only “A” and “B” classes with no taxes. The A’s consume all they produce, as do the B’s; however, the B’s consume in two different forms, personal consumption and investment consumption. Investment consumption is only undertaken by B’s in anticipation of growth. In the second state, the B’s are taxed, with 100% of the taxes going to A’s. In this state, there is no change in total consumption, however, personal consumption is increased, while investment consumption is decreased, leading to slower growth and reduced investment incentives caused by that slower growth and lower after tax returns. In the third state, C’s consume a percentage of the taxes. Since the C’s must be populated by converting productive A’s and B’s into non-productive C’s, total production will necessarily be decreased. In the fourth state, A’s incentive to produce is discouraged by withdrawing transfer payments for the most productive of the A class. In the final state, B’s incentive to invest disappears and A’s productivity or ability to work at all suffers. Thanks, Dan, you always start my day with the sweet smell of reality before the foul stench of the national media attempts to convince me that the emperor Obama is fully clothed and his policies proven. Looks like staying out of the OECD is evolving as a prerequisite for a country to maintain prosperity in the next fifty years. Great post, Dan. Agree the Economics Dept of OECD is much more sensible than the other areas. Back when I was in the Australian Treasury, we’d pay attention to the Economics Dept work – their analysis of tax impacts is great – and ignore much of the rest.